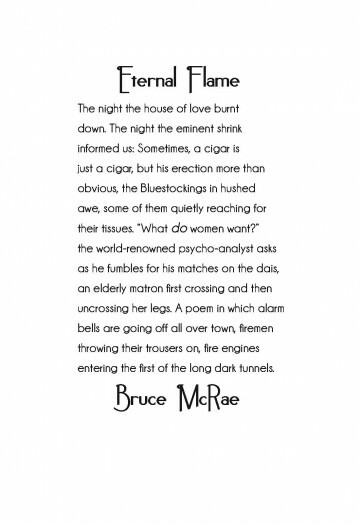 Pushcart-nominee Bruce McRae is a Canadian musician with over 800 publications, including Poetry.com and The North American Review. His first book, The So-Called Sonnets is available from the Silenced Press website or via Amazon books. To hear his music and view more poems visit his website: www.bpmcrae.com, or ‘TheBruceMcRaeChannel’ on YouTube. The typefaces needed to be a bridge between the Victorian and the modern, something sans serif but still with a self-conscious curve. Champagne & Limousines provides the curves, the o’s and a’s and even the bowls of the lower case g’s all resemble the mouth of the long dark tunnel at the poem’s end. Noir-et-Blanc curves, too, but with a little excess of ornament on the capitals. The kind of flourish a Bluestocking might pencil onto the world-renowned psycho-analyst’s name in her program.